After hunkering down all of Saturday and watching the blizzard rage on into the night, we were excited to see the sun beaming down today. Perfect weather to play outside and enjoy the accumulation from one of the most powerful snowstorms to ever hit the East Coast. Despite plenty of practice over Munchkin’s first year of life, S dreaded our current trip stateside. With the possible exception of her first trip overseas with Munchkin when he was just 7 weeks old, she had not experienced this acute a level of pre-departure stress. 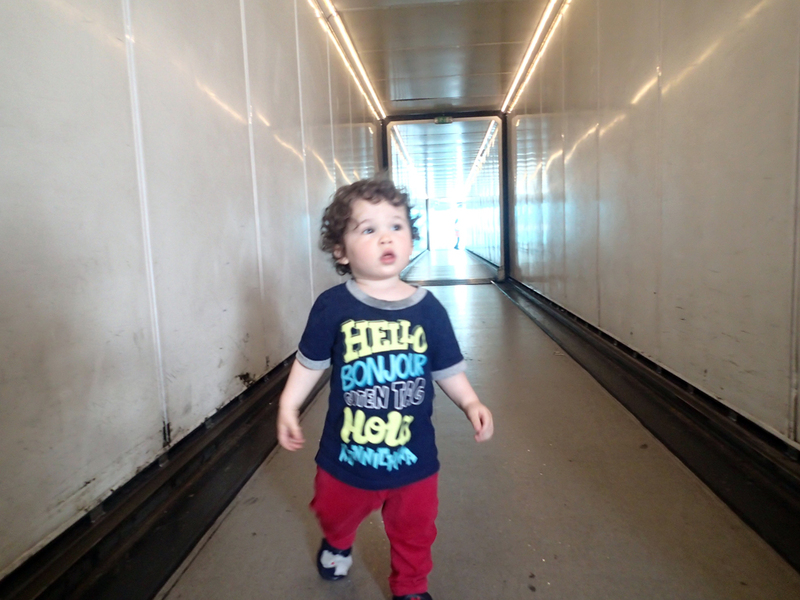 Munchkin had just started taking his first independent steps when we last took him on an airplane, and we had a rough time on the flights. That trip was to Lisbon — a four-and-a-half-hour non-stop flight for vacation. This time, not only did we intend to take Munchkin on a much longer flight, but we also took advantage of the trip home to bring our dog back to the United States, which added several layers of travel anxiety to the mix.